RESEARCHERS from Bengal Engineering and Science University in Howrah, West Bengal, claim to have found a cheap and effective way of controlling mosquito breeding: water-soluble carbon nanoparticles (wsCNPs). In a paper published online on September 12 in RSC Advances, the researchers showed that when mosquito larvae ingested the nanoparticles, their metabolism slowed down, they did not attain the pupal stage and slowly died. The nanopowder could be of immense use in managing mosquito larvae breeding sites. The researchers used wood wool, readily available at any carpenter’s workshop, to produce the powder. The process was similar to that of making kajal. The researchers used two earthen pots—one to keep wood wool and the other to cover it. The wood wool soot deposited on the upper pot was scraped out and washed with acetone. The washed soot was then air dried and oxidised with nitric acid to obtain wsCNPs. The nanoparticle was tested on three types of mosquitoes–Anopheles, Aedes and Culex. To monitor the growth and life cycle, optical fluorescence microscope was used for imaging. One-day-old larvae were cultured in three laboratory aquariums. The larvae were administered variable doses of wsCNPs (0.5, 1, 2 and 3mg/l). It was found that a dose of 3mg/l arrested the growth of mosquito beyond the larval stage and after four weeks the larvae perished. 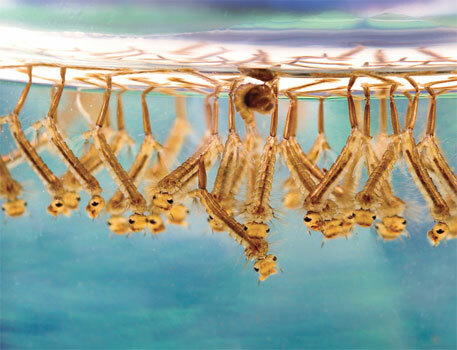 To test for toxicity, a year-long study was conducted on zebrafish which were fed wsCNP-ingested dead mosquito larvae. No adverse effects were reported. According to the authors, carbon nanomaterials do not get absorbed by body tissues and may not possess the threat of entering the food chain. In the US, carbon produced from burnt vegetables is approved by the Food and Drug Administration and isÃ”Ã‡Ãªused in a homeopathic gripe water for infants. “The idea of testing nano carbon for mosquito larva emerged as an off-shoot of a previous work on cancer drug delivery. We were studying this using fruit flies and mosquitoes when we observed this effect of the nano particle,” says Sabyasachi Sarkar, chemist and co-author of the study. “The process of making 3mg of wsCNPs, excluding labour costs, came close to less than a rupee. It took a couple of hours to wash the soot with acetone and an overnight treatment with nitric acid. Overall the material synthesis took three days,” Sarkar told Down To Earth. David Sullivan, associate professor of microbiology and immunology at Johns Hopkins Malaria Research Institute, US, says the study looks promising enough to be tested in field. However, he also says that further research is needed to assess if the water treated with wsCNPs is fit for drinking after purification. Why cant we just increase the number of mosquito predators instead of manufacturing nanoparticles to wipe out an insect species? The increase in mosquitoes came about by an increase in overall climate temperatures right? so we are responsible for it! why not try n fix what we messed up in the first place?? Growing back rainforests will help! I'm surprised to read Down To Earth reporting this without raising a single question about the potential environmental effects of introducing something in the waters that can stunt larval growth and eventually kill larvae. Yes, they tested for toxicity in zebrafish, and report there are no adverse effects, and there are questions at the end about safety of the water for human consumption. But what about all the other larvae and insects and small creatures living in the water alongside the mosquito larvae? Will they be affected? And if so, what are the ripple effects on the aquatic food webs? We already know from studies in Europe that effective mosquito control comes at the price of reducing populations of Swallows which feed on them in their breeding season. Nice to have a potentially cheap and effective means of controlling mosquitos, but as the previous commenter asks, we need to put this within a broader ecological context and ask what else we can do. "The larvae were administered variable doses of wsCNPs (0.5, 1, 2 and 3mg/l). It was found that a dose of 3mg/l arrested the growth of mosquito beyond the larval stage and after four weeks the larvae perished. " This experiment is on concentration,so what happens if its more concentrated and less concentrated ? Maximum breeding is due to faulty design of drains and mismanagement . Thank you for the comments on the article. Please find below response to comments 1, 2 and 3 on behalf of the researchers of the study. Response to comment 1(anonymous): mosquitoes breed in close proximity to human dwellings, for example like coolers. It is difficult to check on their population. Secondly, to control the temperature(which is not the cause for mosquito menace) we have to stop to burn fossil fuel first. Comment 2 (Madhusudan): Water soluble nano carbon is readily excreted from the body. Studies on nano carbon mention of their use to enhance the growth of plants and fruits. Tests with E-coli have been carried out and no health hazards have been reported. In the US, such nano carbon are used in gripe water (approved by US Food and Drug Administration) to help infants (5-6 days old) with stomach problem and no ill-effects have been reported. We are looking forward to further experiments but would like to know if there have been experiments/studies that suggest the effects of liquid mosquito repellent vapors on human health? Response to comment 3 (Indulkar S): If it is less concentrated then by large nothing happened and if it is more than the effect is the same once the concentration crossed 3mg/l. Agreed that mismanagement is the cause of breeding as mosquito.